I TEND not to use many products from the mainstream bait suppliers. I don’t use boilies at all, and I rarely use the hair-rig. Instead, in recent years, my interest has been in the use and development of baits and rigs that lead to quick takes and fast strikes. Because I want to match my strikes to the way that carp actually feed – that is, sucking and blowing in food - often food that is suspended in a carp-made “food cloud”, if the modern underwater videos are to be taken seriously – then I only use one rod at a time. This allows me to strike quickly at the first indication of a positive take. As readers of the Carping Gnome will have guessed, I tend to use sight-bobs, from the trout fishing world, as close-range floats. When free-lining or ledgering, I tend to use a very light bobbin, - one I’ve made myself from a starlight. I call this a Weeble; although mine will wobble and it will certainly fall down! Allow me to explain. I put a bit of clear silicon tubing at the top and bottom of the starlight. To the top bit I attach wire – from a plastic-coated paper-clip. I bore the silicon tube to pass it through, and then bend the wire into a U-shape, to form a line clip. I also bore the bottom piece of tubing, then I pass braid through it to form the link to a clip which, obviously, is attached to the front bank stick. So why “a Weeble?” Well, I then use red wax from Dutch cheese to add a little more weight to the bobbin, by moulding it into a ball at the bottom. When fishing, I set the bobbin so this wax ball is on the ground and the bobbin is standing upright. With a normal run, the bobbin goes up, of course, with a drop-back, it will lean to one side and/or drop over. It really works. Either way, you’ll get a bleep on the old Optonic. I tend to use fluorocarbon, because it sinks better that mono and you can get a really nice line from the rod to the bait, - by gently correcting the course of the fluoro as it sinks. This, I think, dramatically improves the sensitivity of the rig – so much so, on a recent winter outing with fellow members of the Traditional Fisherman’s Forum, I was able to “nail” a 2oz rudd in the top lip, after a huge hunk of bread flake had been cast close to the far bank. Yes, this was hardly an impressive angling achievement, in terms of fish size, – but you see my point? I’m also “into” what I call “soft baits”, - and well in advance of Nash marketing its latest round of “glugs”, which are a mix of liquids and dissolving powder, purely by chance I was carrying out similar experiments of my own. The honey bonds the powder to the bread. In the water, a carp-attracting cloud billows out – both liquid and minute particles. I used this technique first of all at Clay Farm Pond in March 2009, and I was gratified to land eight commons that day, to low double figures. Dry powdering is good for surface baits too, of course. Since then, I’ve been experimenting with extra-thick double cream as a “glug”, to which I often add mild curry powder – dry - as the powder element. 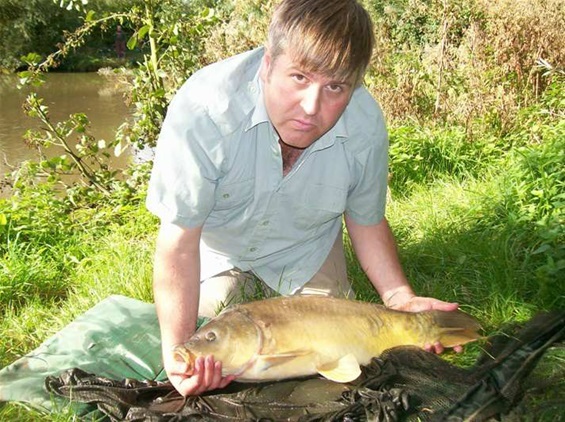 Rod Hutchinson is a great believer in the power of milk-based products to attract carp, and cream is certainly a great attractor. The size of a cream cloud in water has to be seen to be believed, and the fish really turn on to it. The first time used this technique was, again, at Clay Farm in the late summer of 2012 – and my records show that I caught eleven carp at very close range. Despite so many being caught from under my feet, they seemed to be totally pre-occupied with the bait and free offerings. At the time I was glugging broken-up prawns – another “soft bait”. I like glugs because you don’t have to over feed but they are mighty attractors. I like soft baits because you can completely hide a hook – which must be a good thing – but have confidence that a firm strike will set that hook. Picture above: The Gnome with a mirror that fell to sight-bobbed prawns. I want to try corn,then prawns (with cream and curry). Fish are easily spooked. Would you bother with groundbait, ot just delicate free offerigs ott of fish? It will be rather cold on Sunday, Ben - but I wish you well. Going on Sunday. The lake I fish is owned by a neighbouring school. It ceased to be a day ticket 10 years ago and now i'm the only one allowed to fish it. thanks Gary. Also joined TFF, so i can stop bothering you for tips! Bother me all you like Ben! Really, I don't mind. Hi Ben, use extra thick double cream and just mix in what you like - curry powder, honey etc. Take a little hand towel - it can get messy. Gary, for the cream glug, is it just cream or do you mix it with honey (like the hot water) to make it sticky? You are most welcome, Ben.